This article is about the 2004 game. For the 1996 game, see Fable (1996 video game). For the series, see Fable (video game series). Originally developed under the name Project Ego, Fable's development involved more than 150 people. The game's music was composed by Russell Shaw, with the opening title theme written by Danny Elfman. 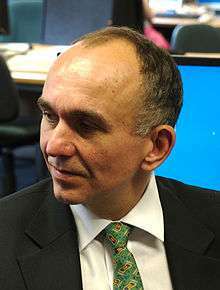 The game's release was widely anticipated, due in part to Lionhead cofounder Peter Molyneux's enthusiastic hype of the game. Fable was well received by critics for the quality of its gameplay and execution, though the failure to include many promised features was noted. Fable was the top-selling game of September 2004 and sold more than two million units by 2007. The game was followed by two sequels, Fable II in 2008 and Fable III in 2010. Fable Anniversary, a high-definition remake of the game that includes The Lost Chapters, was released for the Xbox 360 in February 2014. Other actions besides alignment affect the Hero. Eating too much causes the character to gain weight, while drinking excessive amounts of beer causes Heroes to become sick and vomit. Clothing, which provides defence in combat situations, also changes the Hero's attractiveness or scariness as well as alignment in some cases, and townspeople's reactions to the Hero accordingly. Bright clothing makes the character look more noble to the townspeople, and thus cause them to praise and respect him. Dark clothing causes the character to seem evil or threatening to townspeople and cause them to fear him. Heroes can be further customized via hairstyles, facial hair, and tattoos. The Hero's attributes also affect appearance; high levels of Strength increase brawn, high levels of skill increase height, and high level spells create glowing arcane patterns on the Hero's body. Fable takes place in Albion, a patchwork of city-states with lawless stretches of plains and forest between them. Once called the Old Kingdom, the entire land was once led by an ancient royal bloodline, bestowed with the title of Archon. The first Archon's rule was peaceful and prosperous, but the source of his power was an ancient and powerful sword (the Sword of Aeons) that gradually began to corrupt him and, eventually, his entire kingdom. By the time the events of the game take place, the world has slowly deteriorated from the days of the Old Kingdom. One of the most prominent institutions of Albion is the Heroes' Guild. The Guild is a centre of learning and training for Heroes, renowned mercenaries that are active in all parts of Albion. Heroes are hired as thieves, soldiers, guards, rescuers, and protectors; the Guild makes no moral judgement on the actions of its Heroes. Later on in the Hero's life, after he has gained more recognition among the people of Albion, he is invited to fight in the Arena, where he meets the legendary Hero named Jack of Blades, who runs the arena battles. As a final challenge, Jack pits the Hero against his rival, which was also once his childhood friend/room-mate back in the Guild—Whisper; when the Hero defeats her he may kill or spare her. 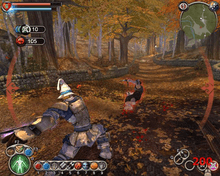 Early in Fable's development, the game was called Project Ego. Fable previews noted that the somewhat absurd humor and atmosphere of the game, which GamePro called "Terry Pratchett or Piers Anthony fantasy" was far different from what was seen on contemporary RPGs. With the exception of the title theme, Fable's music was composed by Russell Shaw, who had previously worked on Molyneux games such as Magic Carpet and Black & White. The job for composing Fable's theme music was given to Danny Elfman. Elfman noted in an interview that Hollywood composers did not typically cross over to video game work, in part because many game developers wanted a synthesized score that sounds like an orchestra, instead of the real thing. At Elfman's insistence, the developers used a small orchestra, which Shaw noted was much more of a challenge than previous projects; "There are more people involved (even without considering the orchestra), and the complexities of any music interactivity are brought to the fore." Lionhead Studios announced Fable Anniversary, a remastered version of Fable: The Lost Chapters, for release on the Xbox 360 later in 2013. It features overhauled graphics, a new save system and incorporates Achievements. On 13 September, Ted Timmins, lead designer of the game, announced that the game's release date will be pushed back to February 2014. Later that year on 12 December 2013 the release date was announced as 4 February 2014 in North America, 6 February 2014 in Asia and 7 February 2014 in Europe. On 2 June 2014 the game was also confirmed to be coming to PC. It was released on Steam on 12 September 2014 and includes mod support. Fable Anniversary was in full development for 15 months. One of the features that were not included in the game's release was the Hero's ability to have children despite the fact that Molyneux had previously mentioned that the Hero's own children would be significant in the game. Molyneux reacted to these complaints by means of a public apology posted on the official Lionhead forums, on which he said, "If I have mentioned any feature in the past [that], for whatever reason, didn't make it as I described into Fable, I apologise." This issue was rectified in Fable II and III, both of which include the ability to have children. Fable was a commercial success upon release, selling 375,000 copies in North America during its first week, and 600,000 copies in the first month. The game has sold around three million copies worldwide. In 2005, a Microsoft Game Studios representative stated that Fable would be among the franchises that would appear on the next-generation Xbox 360. Sequels Fable II and Fable III were released in 2008 and 2010, respectively. 1 2 "Fable Anniversary Release Date and Bonus Content Announce!". Lionhead Studios. Microsoft. 12 December 2013. Retrieved 12 December 2013. ↑ Staff (4 June 2013). "Relive the Magic with Fable Anniversary for Xbox 360". Xbox Wire. Retrieved 4 June 2013. ↑ Loe, Casey (2004). Fable: PRIMA Official Guide. "Fundamentals – Training: Quests". United States of America: Random House. pp. 4–6. ISBN 0-7615-4179-9. 1 2 Fable (Xbox) manual. "The Way of a Hero". Microsoft Game Studios. 2004. pp. 18–19. ↑ Cohen, Peter (13 June 2008). "Mac Software: Fable: The Lost Chapters". Macworld. Retrieved 8 August 2008. ↑ Loe, Casey (2004). Fable: PRIMA Official Guide. "Chapter 4 – Stop Jack of Blades". United States of America: Random House. p. 97. ISBN 0-7615-4179-9. 1 2 3 Carter, Dene; Simon Carter (14 June 2002). "Developer Diary #1: Out of the Blue". Lionhead Studios. Archived from the original on 26 February 2010. Retrieved 11 September 2007. ↑ Carter, Dene; Simon Carter (22 September 2002). "Developer Diary #5: Demo Days". Lionhead Studios. Archived from the original on 2 January 2010. Retrieved 11 September 2007. ↑ Saltzman, Marc (29 September 2004). "Fable weaves fun fantasy adventure". USA Today. Retrieved 11 September 2007. ↑ Carter, Dene; Simon Carter (6 December 2002). "Developer Diary #8: A Living World". Lionhead Studios. Archived from the original on 20 April 2010. Retrieved 11 September 2007. ↑ Staff (18 April 2003). "Xbox Previews: Fable". Computer and Video Games. Archived from the original on 17 April 2008. Retrieved 4 August 2008. ↑ Dingo, Star (7 July 2003). "Fable". GamePro. Archived from the original on 7 June 2011. ↑ Adams, David (18 March 2004). "Danny Elfman does Fable". IGN. Retrieved 9 August 2008. 1 2 Leone, Matt (28 July 2004). "Previews: Fable – Hollywood legend Danny Elfman dishes the inside dirt on his music". 1UP.com. Archived from the original on 31 March 2013. Retrieved 29 July 2008. ↑ Staff (1 November 2004). "Interview with Fable audio director and composer Russell Shaw". Music4Games. Retrieved 8 August 2008. ↑ "Portfolio: Macintosh". Robosoft Technologies. Retrieved 9 December 2014. ↑ Staff (13 March 2008). "Fable: The Lost Chapters – Release Date". Feral Interactive. Retrieved 29 July 2008. ↑ "Fable Anniversary Coming Soon!". Lionhead Studios. Archived from the original on 8 June 2013. ↑ Iuglio, Anthony (2 February 2014). "Don't Overlook Fable Anniversary". Pixelvol. Pixelvolt. Retrieved 3 February 2014. ↑ Katie (13 September 2013). "A Letter to All of Our Fable Fans". Lionhead Studios. ↑ Karmali, Luke (13 September 2013). "Fable Anniversary delayed". IGN. Ziff Davis. Retrieved 13 September 2013. ↑ Jackson, Mike (2 June 2014). "Fable Anniversary headed to PC". Computer and Video Games. Future. ↑ "Fable Anniversary on Steam". Valve Corporation. ↑ Chalk, Andy (11 September 2014). "Fable Anniversary will support modding with included Unreal Engine 3 editor". PC Gamer. Future plc. Retrieved 11 September 2014. ↑ Yin-Poole, Wesley (21 January 2014). "Definitely not on rails". Eurogamer. Gamer Network. Retrieved 22 January 2014. 1 2 "Fable Reviews". GameRankings. Retrieved 8 August 2008. 1 2 3 Fable: The Lost Chapters Scores (Xbox and PC). GameRankings. Retrieved on 10 August 2008. 1 2 "Fable (xbx: 2004)". Metacritic. Retrieved 8 August 2008. 1 2 3 Fable: The Lost Chapters Scores (Xbox and PC). Metacritic. Retrieved on 11 August 2008. 1 2 Staff (16 September 2004). "Reviews: Fable – The Legend of You". 1UP.com. Archived from the original on 31 March 2013. Retrieved 29 July 2008. ↑ Staff (17 September 2004). "Review: Fable". GamePro. Archived from the original on 4 July 2008. Retrieved 4 August 2008. ↑ Kasavin, Greg (4 September 2004). "Fable for Xbox Review". GameSpot. Retrieved 7 August 2008. ↑ Lopez, Miguel (10 September 2004). "Fable (Xbox): Review". GameSpy. Archived from the original on 31 March 2013. Retrieved 8 August 2008. ↑ Goldstein, Hilary (27 August 2004). "IGN: Fable Review (p. 1)". IGN. Retrieved 7 August 2008. ↑ "Fable: Awards". Lionhead Studios. Archived from the original on 12 July 2008. Retrieved 11 September 2007. ↑ Tilley, Steve (10 October 2004). "Fable Guru: It's All My Fault". Toronto Star. p. S27. ↑ Buchanan, Levi (23 September 2004). "Moral choices have (limited) consequences in Microsoft's Fable". Chicago Tribune. Retrieved 11 September 2007. ↑ Yusuf, Bulent (24 October 2004). "Digital Culture; Making the Myth". The Observer. p. 76. 1 2 Molyneux, Peter (1 October 2004). "A message from Peter Molyneux". Lionhead Forums. Archived from the original on 4 April 2007. Retrieved 19 August 2007. ↑ "World Exclusive: Peter Molyneux talks Fable – Part Two". spong.com. 2 October 2003. Retrieved 16 November 2007. ↑ "World Exclusive: Peter Molyneux talks Fable—Part Three". spong.com. 1 October 2003. Retrieved 16 November 2007. ↑ Bishop, Stuart (4 October 2004). "Molyneux apologetic over missing Fable features". Computer and Video Games. Retrieved 24 August 2008. ↑ Kasavin, Greg (6 September 2005). "Fable: The Lost Chapters (PC) Review". GameSpot. Retrieved 23 August 2008. ↑ Lee, Garnett (28 April 2005). "Preview: Fable: The Lost Chapters (PC)". 1UP.com. Archived from the original on 31 March 2013. Retrieved 24 August 2008. ↑ Staff (21 September 2005). "Review: Fable: The Lost Chapters". GamePro. Archived from the original on 21 June 2008. Retrieved 19 August 2008. ↑ Adams, Dan (17 May 2005). "E3 2005: Fable: The Lost Chapters". IGN. Retrieved 13 August 2008. ↑ Adams, David (23 September 2004). "Fable Sells Big". IGN. Retrieved 31 March 2013. ↑ "Fable Continues to Break Records as Best-Selling Game Across All Platforms". GameSpot. 21 October 2004. ↑ Parfitt, Ben (11 August 2010). "5m sales goal for Fable III". Market for Home Computing and Video Games. Intent Media. Retrieved 3 June 2014. ↑ Thorsen, Thor (3 April 2005). "Next-gen Halo, Fable, and Project Gotham confirmed". GameSpot. Retrieved 13 August 2008.